This is more named for the ingredients than really it being "Mashed Broccoli"... I've been making a recipe that I found on the back of a bottle of Ranch dressing for the past couple of years, and the family really likes it. It's called Ranch Baked Chicken. The recipe is really simple. 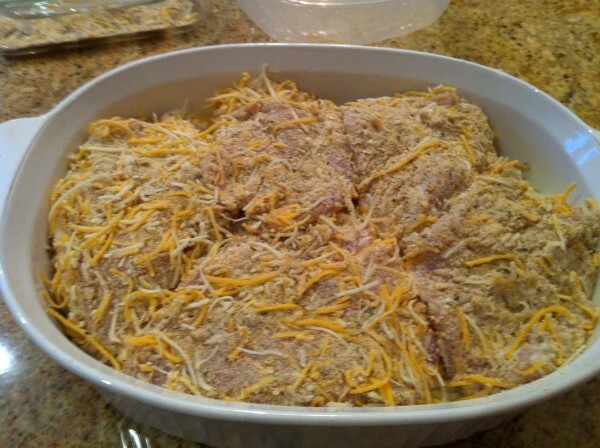 5 - Chicken Breast (pounded so they are uniform in thickness - will help them cook evenly). Put the Chicken breasts in the Ranch Dressing - coat evenly. Combine the bread crumbs and shredded cheese. 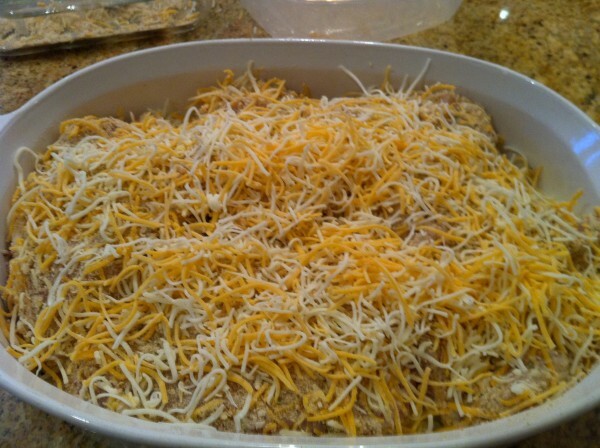 Evenly coat the ranch covered chicken in the breadcrumb and cheese mixture. Take a good sized casserole - I used a 8 quart casserole. Spray it with Pam or any other type non-stick spray. 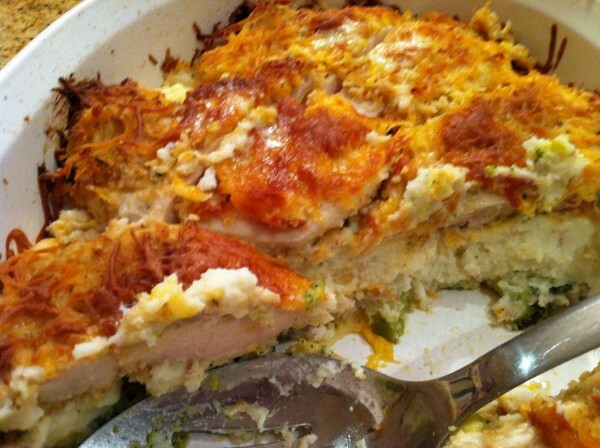 Put a layer of frozen Broccoli on the bottom of the casserole. 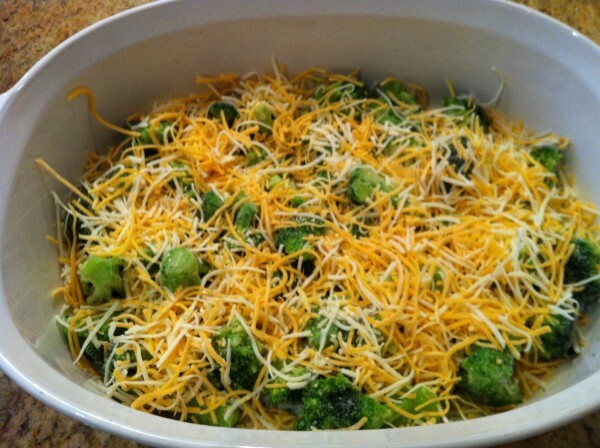 Put a layer of shredded cheese no top of the broccoli. Next, I made a double batch of mashed potatoes, specifically I used the Idahoan Roasted Garlic & Parmesan Baby Reds brand mashed. 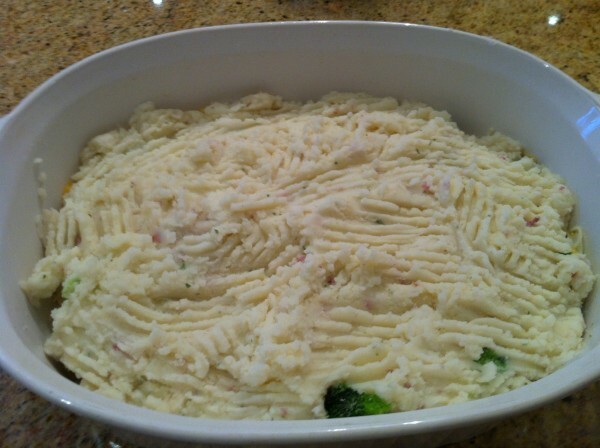 Make per the directions and then put a layer of mashed right on top of the Broccoli. Put in an oven of 350 degrees Fahrenheit for about an hour. I started with 1/2 hour, then I bumped the temp to 400, then bumped it again to 425. So, I'm thinking if I did the whole thing at the same temp, for a longer period of time, it would have been better. I did the first 1/2 hour uncovered, and it made the cheese nice and crunchy - after that, I put a small dollop of butter on each chicken breast, covered it with foil and finished cooking. The result was the most delicious thing I've had all year (and it's only the 4th). I'm lucky that Eileen works for Friendly's, so I get their frozen broccoli and it's awesome. The final product – delish!